The What: Grundorf has added two cases—the T4-WR-001A and T4-WR-002A—to its Tour 4 Series line of cases designed for wireless microphone systems. Both models are 1RU systems with protective foam both above and beneath the single rack space where the wireless receiver is mounted. The What Else: The front and rear lids are foam lined and designed to accommodate equipment: the front for the wireless microphone and transmitter, the rear for antennas and accessories. Customers have the choice of cutting the foam themselves to accommodate their equipment or having Grundorf handle this. 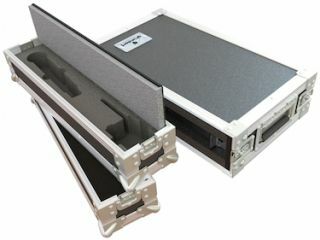 The Tour 4 Series racks are constructed of ¼-inch plywood with an ABS laminate finish and a sturdy aluminum extrusion. Depth is 12 inches on the T4-WR-001A and 16 inches on the T4-WR-002A. The Bottom Line: The Tour 4 Series will be on display at InfoComm 2016. Multiple color choices are available and the cases are available for purchase now.